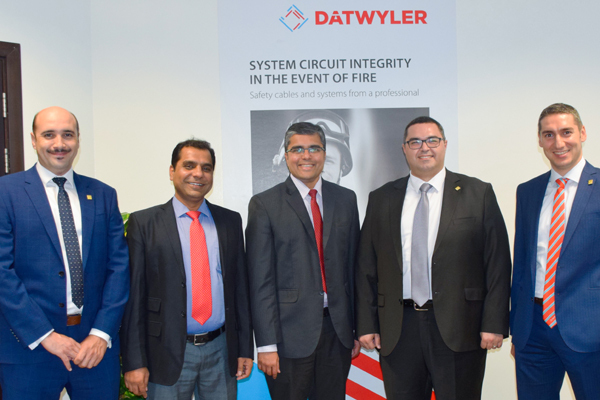 UAE-based Easa Saleh Al Gurg Group said its flagship company Scientechnic has partnered with Datwyler Middle East for the exclusive distribution of its fire cables in the region. The Swiss manufacturing company provides system solutions and services for future-proof ICT networks, fire safety cable systems and elevator cable systems in public and commercial buildings. Datwlyer’s halogen-free safety cables are certified by Dubai Civil Defence and used for emergency lighting and fire alarm systems in residential and commercial buildings guaranteeing reliable power supply to the safety systems installed. Scientechnics’ General Manager, Easa F. Al Gurg said: "As the importance of security investment in infrastructure continues to grow, this strategic partnership with Datwyler will help Scientechnic in offering extensive tailor-made solutions to a critical industry sector." "By combining our proven expertise with distribution, trading and fire safety solutions, we can provide additional value to customers and clients in the region," he stated at the signing ceremony held in Dubai. It was attended by senior officials of Datwyler Middle East including Asem Shadid, its managing director, Shaheer Shaban, the head of technical and project management and Ahmed Krayem, the sales manager of the Swiss company. Stewart Panichiyil, the division manager of Industrial Stock Sales - which represented Scientechnic - and Mohammed Abdul Mubeen, the senior sales executive, were also present. Scientechnic works in partnership with the best in the industry worldwide to provide 360 degree services right from design, supply, installation, testing, commissioning and maintenance of renowned electrical products and solutions, said Al Gurg.